CAFA is thrilled to provide a mentorship program to benefit the 2016 winners of The Swarovski Emerging Talent Award, Fashion, The Swarovski Emerging Talent Award, Accessories and The Fashion Design Student Award. Talented and successful professionals have agreed to generously donate both time and expertise throughout the year to help these designers grow their brand and their business by providing assistance in critical business areas including Public Relations, Branding, Marketing, Finance, Distribution, and Digital support. Suzanne Timmins is Senior Vice President and Fashion Director of Hudson’s Bay and Lord & Taylor where she is responsible for the fashion and trend direction for both banners. Under her leadership, Hudson’s Bay and Lord & Taylor have become top destinations for men’s and women’s fashion, accessories, shoes and home. A seasoned fashion executive Ms. Timmins’ illustrious 25-year career has spanned diverse retail environments, ranging from luxury retailers, department stores and mass consumer chains. Ms. Timmins led the development of the highly acclaimed 2010 Olympic collection for Hudson’s Bay, one of the most successful collections for the brand. She also pioneered the revitalization and re-launch of Hudson’s Bay’s Company collection. Creating unique retail concepts is the foundation of her career and her ability to spot the new and the innovative readily lends itself to the discovery and acquisition of the best international designer labels. Her acute ability to determine what is relevant, current and fashionable contributes to a world-class shopping experience for Hudson’s Bay and Lord & Taylor customers. A definitive voice of fashion, Ms. Timmins is consistently profiled by the international fashion media including WWD and Harper’s Bazaar and is also a trusted commentator on design and style. An advocate of new design talent, Suzanne has lent her time to a number of initiatives including sitting on the jury of Andam, the British Fashion Awards nominating committee and TFI New Labels competition. Do you dream of successfully bringing a new idea for a product or design to market? 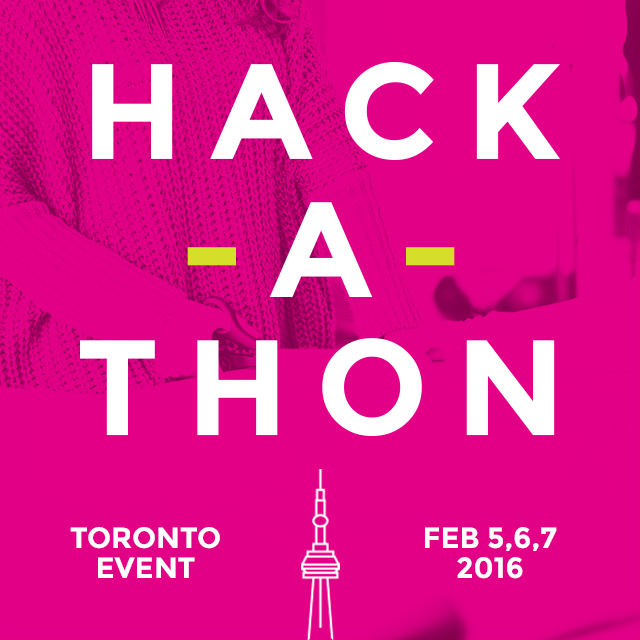 If so, don’t miss MSH District’s Hack-A-Thon, a three day fashion innovation event taking place at BrightLane this February 5th-7th in Toronto. Watch your concept for a creation made of fabric transform into reality with a team of experts committed to your success. 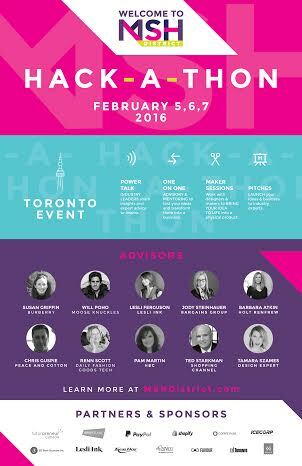 The Hack-A-Thon will welcome seasoned specialists such as HBC’s Pam Martin, Will Poho of Mooseknuckles, Mark Brasier from Toms shoes, and manufacture and production consultant Golam Ahmad Khan from Fabrikite. Attendees will also receive a front row seat for a PowerTalks feature, starring Burberry’s Susan Griffin, who will discuss what it means to be a luxury brand, and Joanna Griffin, founder of Knixwear, who will explain how she surpassed the one million mark through her latest crowd funding campaign. 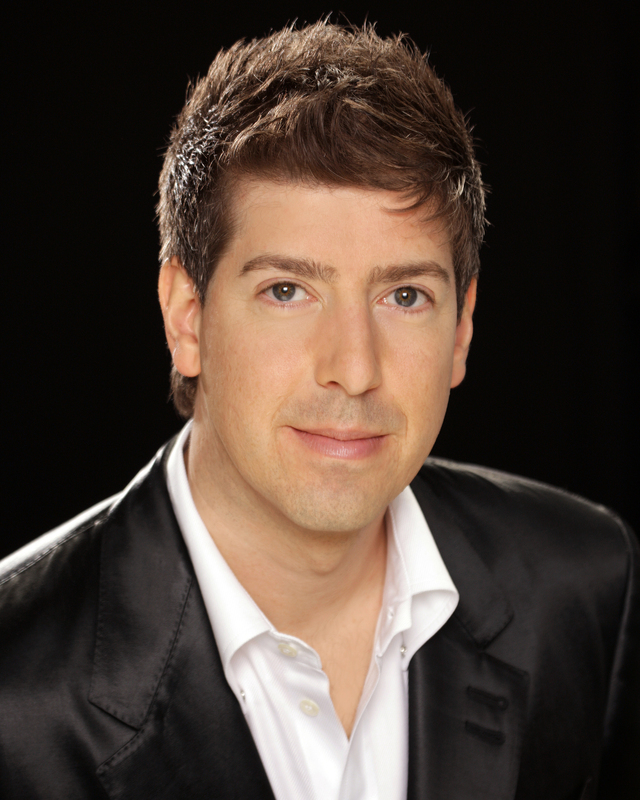 Ron White is the CEO and Creative Director of Ron White Shoes, one of Canada’s most celebrated footwear brands. Over his twenty years of success in the industry, White has developed his reputation as “Canada’s Shoe-Ru” — a title that references his mastery in design and his loyal celebrity following around the world. I am honoured to have so many smart and stylish women in my shoes on a regular basis. The reaction to my collections by other retailers in both Canada and the US has been so gratifying —Ron White, CEO and Creative Director of Ron White Shoes. With a background in both biomechanics and fashion footwear, it is no surprise that Ron White Shoes take an innovative approach to combining style and comfort. The brand’s All Day Heels® technology, for instance, uses NASA-created PORON material paired with unique constructions making for elegant, sophisticated shoes that can be comfortably worn all day. Ron White’s unique offerings have earned him a discerning high-profile clientele; from Jeanne Beker to Mrs. Laureen Harper and American television personality, Katie Couric. “When I think back to myself 20 years ago – launching with a Visa cash advance and a sleeping bag in the stock room of my first store on Yonge St – I am proud and humbled of where I am today,” —Ron White. White’s business and design prowess have also been recognized with national and international accolades. The designer was named International Retailer of the Year by Condé Nast in 2011, (a Canadian first) and was inducted to the Sheridan College Business Hall of Fame in 2006. In addition to running a successful fashion business, White is an avid philanthropist who dedicates his time to giving back to the community. The RON WHITE Foundation focuses on raising funds, education and awareness for human rights issues. The Foundation runs annual events including a breast cancer fundraiser along with Canada’s largest Shoe Drive and raised almost a million dollars for local charities through the White Knight Gala series. Ringing in a very special year, Ron White kicks off the 20th Anniversary of his annual shoe drive on January 7, 2016. With the mantra to follow in the footsteps of your favourite celebrity, the Ron White shoe drive has collected over 35,000 shoes and boots for men, women and children and donated them to GTA charities including New Circles, CAMH, Halton Women’s Centre, Out of the Cold and Dress for Success. Past donors include celebs like Matt Damon, Celine Dion, Hilary Duff and Rachel McAdams as well as local luminaries Jeanne Beker, Ben Mulroney, Dina Pugilese and The Tenors. 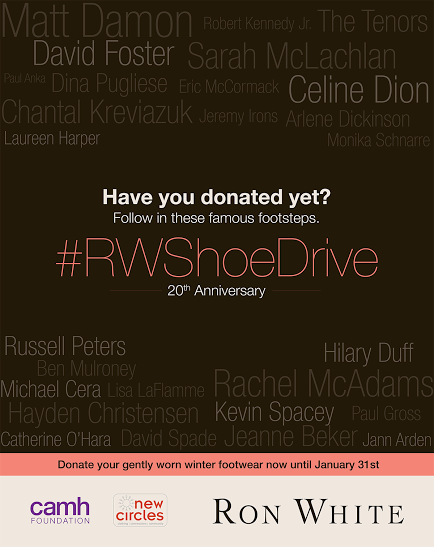 As part of the 20th Anniversary friends and supporters of Ron White are also invited to join this year’s shoe drive by partaking in a social initiative of posting a photo on social with the hashtag #RWShoeDrive. Collections are welcome at all five Ron White Shoes locations through January 31, 2016. The Ron White Collections are sold across Canada at The Hudson’s Bay, Holt Renfrew and through a number of independent retailers, including five Ron White Shoes stores in the GTA. In the US, Ron White Shoes are available through a network of leading US independent retailers as well as Lord & Taylor and Zappos.com.